Take time today and through Holy Saturday to ponder the Passion of Christ from the readings above. To help you prepare and reflect we present you with material from Creighton University on the Good Friday Liturgy. We enter the liturgy on Good Friday in silence. We don’t need a “gathering rite.” It is as though we have been “gathered” since the night before. The first act of the liturgy is for the Presider and ministers to lay face down before the cross, in silence. As with all liturgical rituals, that invites us to lay prostrate before the cross as well. That takes some preparation. The scripture readings take on a special power today, from the quiet and solemnity of the service. These prayers, and their style, are perhaps the oldest liturgical ritual we have. They link us to the prayer of our sisters and brothers down through the centuries. They also give us a sense of our long tradition of public prayer. The Presider makes an invitation to pray – saying who it is we pray for and what it is that we ask. We respond to the invitation with our silent prayer. Then, the Presider prays out loud in our name, first praising God and naming how God has been loving and caring for the person or need we present, then asking for a particular grace. We affirm that prayer with our “Amen.” We could prepare for these great intercessions by reflection on our prayer for each of the people groups mentioned and their needs. That will help us with our responding to the invitation to pray in silence, and to appreciate the powerful words of these ancient prayers. Adoration of the Holy Cross. To “venerate” is becoming a lost experience to many of our cultures. In our growing equal-itarianism, we want and expect everyone to be “equal” (which is a good thing). But, sometimes it is at the expense of reverence. To revere a wise person, an extraordinary role model, or someone who has struggled heroically, is still very important. And part of that is to have reverence for places or objects or symbols which are full of meaning and very special significance for us, because they re-connect us with relationships. Visiting the place where I grew up, holding a newborn baby, treasuring a gift from a loved one, seeing a photograph or piece of art that stirs my spirit, and a thousand other places and things, all can become “religious” and objects of veneration. We want to be prepared to touch, kiss, embrace the cross with the greatest devotion we can express. We want our gesture to be able to ritualize our acceptance for the love, forgiveness and everlasting life that flows from that cross. We want to feel the love of Jesus, to feel it as being “for me,” and to express our grateful response as reverence. Receiving the Eucharist from the Holy Thursday Celebration of the Lord’s Supper. We fast from celebrating the Eucharist today, but we are gathered by the Spirit to re-connect with our celebration of the Lord’s Supper on Holy Thursday. We do not want to forget what that liturgy continues to mean for us. This is the bread that gives life. This is his self-giving love for us. This is our nourishment for our mission. we may have a life unceasingly devoted to you. Departing in Silence, Again. With closing prayer and a blessing, we again depart in silence. We are a people who are full of faith, but who continue to wait for the fullness of our redemption. and everlasting redemption be made secure. After the celebration, the altar is stripped but the cross remains with two candles lit. We leave in Silence. Our leaving in silence links this celebration to the Easter Vigil, as our beginning in silence connected us with Holy Thursday. 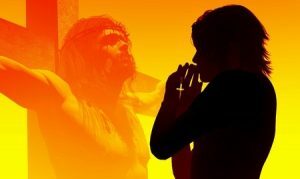 This entry was posted on Monday, April 15th, 2019 at 4:20 pm	and is filed under Easter, Good Friday, Passion of Christ. You can follow any responses to this entry through the RSS 2.0 feed. You can leave a response, or trackback from your own site.